Our custom programmed basemap chips are the solution to getting your vehicle up and running on a socketed/chipped ECU if your engine is either heavily modified or is a mix-match of components. 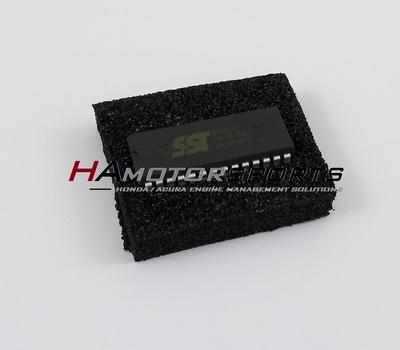 If you are ordering a socketed OBD1 ECU from us at the same time as ordering a basemap, we will install this basemap chip in your ECU and test before shipping. This will offer a simple plug-n-play option that will only require you to install your ECU into your vehicle and then start. As with any custom engine build or change in engine management setup, we HIGHLY recommend dyno tuning whenever possible. This custom basemap is only a BASEMAP to get you up and running. This is NOT to be used as a final tune. Please provide your engine specs at checkout in the comments section so that we may provide the best basemap for your application. We encourage you to provide as much information on your engine setup as possible when ordering so that we may program the best possible basemap for you needs. Please specify your engine block type and any internal modifications, what intake manifold (ie: stock manifold, Skunk2, individual throttle bodies, etc. ), camshafts, if you need any sensors disabled (ie: vtec pressure switch, knock sensor, etc.) All basemaps are designed and programmed in house. We can create a basemap for almost any engine combination imaginable! Knock Sensor: If your engine has a knock sensor installed AND your ECU has knock sensor circuitry then this can be left enabled. This will simply allow the ECU to retard ignition timing if engine knock/detonation is detected. If you are using an ECU that does not have knock sensor circuitry (ie: P28) then this should be set to "DISABLED". Oxygen Sensor: If you have a functioning oxygen sensor installed and would like the ECU to use O2 sensor feedback for emissions, etc. then this can be set to "ENABLED". If you do not want the ECU to use O2 feedback, or you do not have a functioning O2 sensor installed, select "DISABLED". This can typically be left as "DISABLED" on any setup without any problems, and is recommended to be disabled on the basemap if the engine is not stock or nearly stock until the engine is properly tuned.